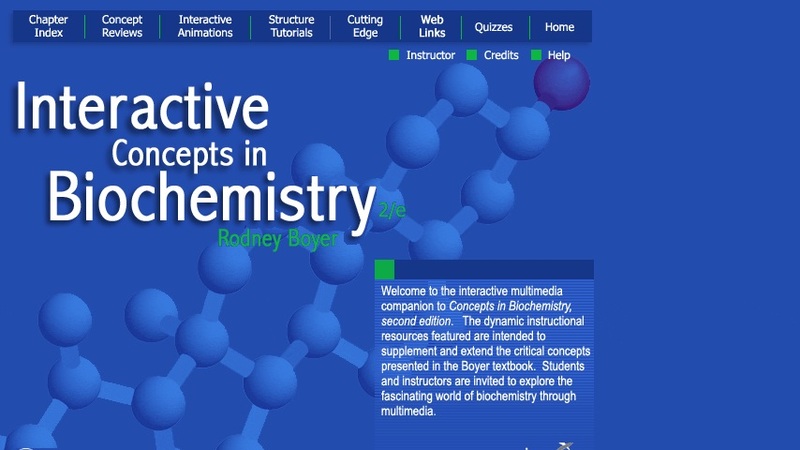 Interactive Concepts in Biochemistry is a nicely designed companion website to Dr. Rodney Boyer's _Concepts in Biochemistry, second edition_. Developed collaboratively by Science Technologies and others, this multimedia site is archived on the Wiley Publishers website. Site visitors will enjoy exploring the engaging and instructive collection of Interactive Animations. The collection includes Animations about DNA Replication, Signal Transduction, Photosynthesis, Cell Structure, Protein Synthesis, and more. The site also features a number of tutorials regarding Kinesin, Myoglobin & Hemoglobin, tRNA, and Protein-DNA Interactions, to name a few. In addition, the website offers reviews of such concepts as Logarithms, Thermodynamics, and Elementary Kinetics; quizzes that correspond to chapters in Boyer's book; and a collection of articles that consider the role of biochemistry in addressing issues like Lactose Intolerance, Alcohol Abuse, and using Methanol as Fuel.